Things have changed radically for me since 2 years. I really don t have time any more to update this blog. As I am focusing on my new website (http://norest4thecollectors.x10hosting.com/), studies and familly life -. I am afraid but that is the end. I will no longer update dead links nor post new stuff. You can find me on dime though, on the bootleg Hubs (DC++) as well and on the openaps. This three-night stint at the Festival Hall is a rare live outing for Jeff Beck, but the largely reclusive genius of Britrock guitar takes to the stage with the glee of a teenager. Dressed in black vest, displaying a muscular physique, he has his white Stratocaster slung low on his hip as he grins, chews gum and unleashes a fusillade of diamond-cutting riffs. 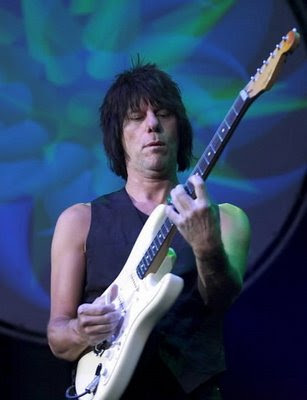 This three-night stint at the Festival Hall is a rare live outing for Jeff Beck, but the largely reclusive genius of Britrock guitar takes to the stage with the glee of a teenager. Dressed in black vest, displaying a muscular physique, he has his white Stratocaster slung low on his hip as he grins, chews gum and unleashes a fusillade of diamond-cutting riffs. With his pudding-basin haircut unchanged since he first wrought several shades of six-stringed mayhem with the Yardbirds, it's hard to forget that Jeff was the role model for Christopher Guest's Nigel Tufnel in seminal rock comedy This Is Spinal Tap. The back projection – archive photos of Beck in his pomp or relaxing at home with his prized vintage hot rods – underlines the connection. But in a selection from his two outstanding recent albums Who Else? and You Had it Coming, he combines his hobby and his art in a way that would have Tufnel scratching his head in disbelief. Beck's flashy technique and sharp changes of gear provide customised thrills as his guitar replicates the sound of blaring horns or roaring engines. At one points he stops, orchestrating the band so that the musical bridge is provided by the sound of an old jalopy setting off on a race projected on the big screen. The sublime followed the ridiculous with his truly awesome rendition of Charles Mingus's "Goodbye Pork Pie Hat". Versatility and ability to stretch the parameters of any genre have always been Beck's calling card, and tonight is the perfect setting for him. Duelling with a percussionist, he unleashes mind-blowing modal scales, plays fat electric skank when the band dip into a loping reggae offbeat, and adds scorching New Age funk to computerised beats on a selection from his hip hop-inflected Guitar Shop album. He's always been an enthusiastic sideman rather than a bandleader, so it's not surprising that Beck's choice of guest stars can be a bit wayward. The declamatory vocalist Imogen Heap and the turgid Roger Waters are the ice to his fire, and lukewarm water was the result. But he finds the perfect partners in the garage-blues duo the White Stripes, reactivating a selection of Yardbirds hits ("Evil-hearted You", "Heart Full Of Soul" and "Lost Woman") with zeal and menace. Jack and Meg White looked vaguely embarrassed when they returned for the final all-star "Hi Ho Silver Lining" singalong, but their earlier contribution insured that Beck's generation-transcending vitality shone brightly. I am unsure where this was recorded at, but most likely it’s Goffert Stadium, Nijmegen Holland, June 22, 1994, as it has exactly the same tracklisting as Live On The Edge. Note : Between Dude and Dream On, they play a short ( 2 min) version of the Howlin’ Wolf blues classic "Born Under a Bad Sign". Interesting to note is that whoever edited this concert put the medley of Peter Gunn etc. before the actual Sweet Emotion, thus a majority of Sweet Emotion is cut and commences from the start of the guitar solo onwards. Dude and Dream On are listed together on the same track, where they could have be separated. Strangely Mama Kin omitted from the recording (after Amazing - poor edit). One of few rare occasions where Flesh and Fever were played in the same set. This concert was probably one of the most dominated with GAG numbers (a majority of it on Disc 1) and apparently the live outdoor debut of Crazy. Alternatively if you seek for live bootlegs of a specific artist please email me - You can use the free email form or use the email button both located on the side column - I will tell you if I have or not.